One normal sunny afternoon I went to the laundry room to start my usual Saturday laundry chore. My old Maytag washer refused to start. I checked repair services in the area and decided that a new washer and dryer would be in order, rather than pay the outrageous prices for a repair. That was 3 years ago. Since then, I have purchased the GE Spacemaker washer/dryer combo, and life has been clean ever since. The GE Spacemaker combo has a high efficient washer on the bottom, and a very quick drying dryer on the top. The nine wash cycles make separating my laundry easy. Most laundry will go in the normal cycle, but it is nice to know that I can wash my delicates and satins very gently and completely on the delicate cycle. The 3 drying cycles not only cuts drying time in half compared to my old dryer, but the “cool down” cycle keeps my from nearly scalding my hands when taking them out of the machine. The combo sets one on top of the other for a fit just about anywhere in the laundry room I want to place it. There are a couple of setbacks, however. The combo retails for over 1000.00, which is a hefty price to pay for a small capacity washer/dryer combo. Another other issue I found was trying to get a combo in any color other than white. Most people do not like using white appliances, as they show the dirt more than a colored group. To sum up my experience with this group, I would have to say that the unit rates a 4 on the 1-5 scale (5 being the best combo on the market) I would refer this combo to anyone that does not have more than 2 family members. Larger families should seek a larger capacity washer/dryer combo. Bought the GE GUD27ESSJWW April 2016 - very disappointed. 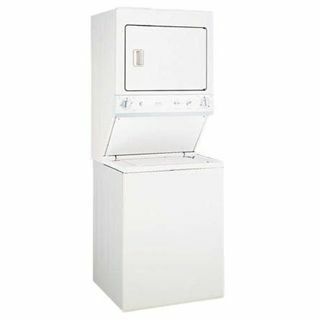 Owned a Maytag stackable washer/dryer for 30 years - loved it - no issues - did a great job. I read online reviews before buying this unit - most were good. However, my repairman warned me - most washers/dryers are cheaply made now and no good ones out there. He advised me to buy the extended warranty for this unit because I would definitely need it! It doesn't fill with enough water to even cover clothes - instruction book actually shows this is normal - pictures of the water level well below the level of clothes. Opening the lid after several minutes shows clothes on top barely wet - and it barely agitates, clothes barely move. So I do smaller loads, x-large water level - still have to manually add a gallon of water (repair man said OK to do this.) This "water-saving" feature not good if the clothes barely get wet! Husband's work clothes have to be washed twice. Stupid temperature settings - hot & warm are fine, but "colors", "cool", "cold", and "tap cold" are all same - COLD. Really? Wash cycle takes a looong time, the spin cycle goes on and on and on and on - it is spin crazy! The clothes get so wrinkled if not taken out right away. Washer lid must be left open when not in use to prevent musty smell. Even when empty, moving the tub around causes water swishing somewhere inside - told by the store that this is "normal". Clothes were not rinsed well and advised by the store to always choose "deep rinse" which is supposed to only be for when adding liquid fabric softener (I don't use.) The "Quick Rinse" cycle fills up with water then immediately spins it out. Then fills again and spins again. Doesn't even swish clothes around. Really? There is no "soak" cycle" - I just have to lift the lid to stop it, go back later to close/restart. Dry sensor on dryer not good - even with barely damp clothes it goes on and on - eventually stops but they are dry if I check them before. No buzzer to let me know when dryer stops - just have to find my wrinkled clothes later. The GE combo washer / dryer works great until it doesn't. We purchased ours a little less than four years ago and the dryer is broken. We don't do excessive amounts of laundry or anything. We paid I think $1,100. The want $500.00 to fix it, I don't think we could get a new stackable for less than $1,300 now. For that kind of money I think it should last more than four years. Join in and write your own page! It's easy to do. How? Simply click here to return to GE Washer Dryer Combo.